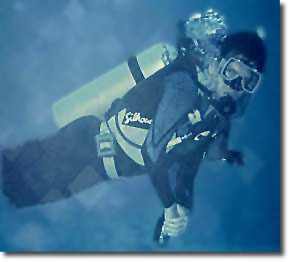 Seriously though, I am a certified NAUI Open Water II diver, and have dived (dove?) in Cozumel, Cabo San Lucas, The Bahamas, NJ, PA, and Hawaii. Out of them all the best, I would say, is Cozumel, with Hawaii a close second. Of course Cabo is the only place I've seen a Brown Spotted Sea Cucumber! My equipment includes Dacor top of the line (circa 1992) first and second stage regulators, Dacor gauges, a Dacor wrist dive computer, and Tusa mask and fins. I also have a semi-dry suit, for those cold NJ dives. Since the wife only likes to dive in warm water, it doesn't get used much. This really bad picture is of me diving in I what I believe was Cozumel. I only wish I had more time (and money) to dive more. It is easily one of the most relaxing hobbies I have.